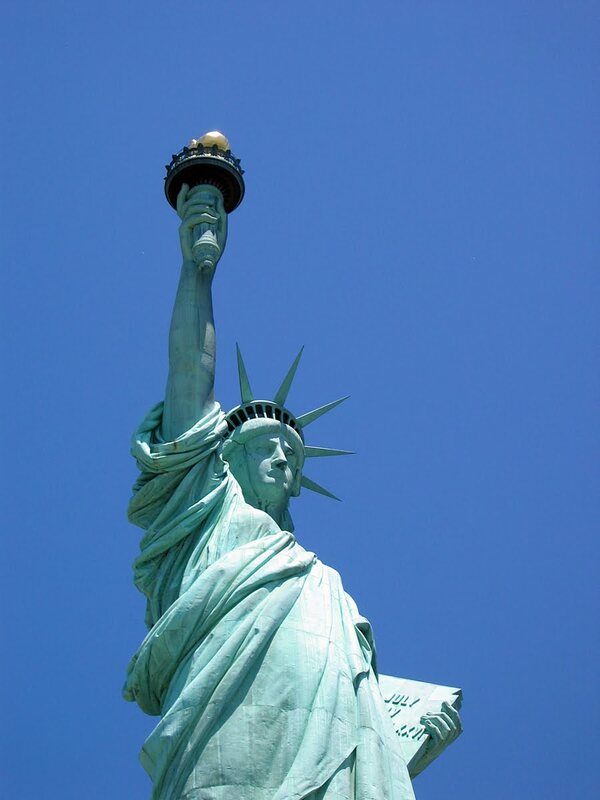 The Statue of Liberty is considered to be the largest Copper Repousse sculpture in the United States. If you look closely at the photo, you can see the seams in the copper pieces. The Statue of Liberty was a gift from the French, intended to celebrate the centenary of the American Revolution, though it was not completed until June 1884. Construction began in France in1875, was completed in June 1884, pieces shipped to the United States in 1885 and was officially dedicated October 28, 1886. The artist who designed this sculpture Frederick-Auguste Bartholdi received a patent on his design in 1879 and it is said that small replicas of the statue were sold, which helped raise funding for the project. The statue's framework was designed and executed by none other than Gustave Eiffel, who later designed and constructed the famous Eiffel Tower. Some stats are: Height is 151 feet. Weight of copper used is 200,000 pounds. Thickness of copper sheet used is 3/32" (approximately 1/32" thicker than 48 oz. copper sheet). More than 300 sheets of copper used. These sheets were individually hand-hammered or pressed into shape using various wooden molds, hence the repousse process. Interestingly, each panel/sheet was backed by an iron strap for rigidity. Each of these straps were fastened to the supporting framework in a way that each section is supported independently of the other with no panel hanging from another or bearing down on another. In 1985, the Statue underwent a major restoration with the 1,350 pieces of the original iron frame being replaced with stainless steel due to severe corrosion problems. Some more interesting facts: Liberty's torch had been plagued with leaks ever since it was modified in 1916 to install internal lighting. Gutzon Borglum, the sculptor of Mount Rushmore, had cut out most of the copper from the flame and installed 250 tinted yellow glass panes. The torch was deemed beyond repair and was hoisted off the statue on July 4, 1984. A team of ten French metalworkers constructed a new torch on Liberty Island using the same techniques and tools as Bartholdi. Old photos and measurements taken from the original were used as a reference so the new torch would remain consistent the original design, except that the copper flame was plated in 24 carat gold leaf (in 1893 Bartholdi had suggested gilding the statue when he was disappointed by its lighting). The new torch was raised into place on November 25, 1985 and the original torch was placed on display for visitors in the lobby of the museum in the pedestal. I never knew that the Statue of Liberty used up a lot of metal to be made! I gotta commend the French on making it for us Americans. Talking about metals, I fixed our pipes by using some stainless steel banding strap to keep them in place, or else, they will collapse on their own weight (and water pressure). With some leftovers steel strapping and some scrap metals, I usually do some art projects on my own on my free time, like doing some key chains or baskets. Yes, it was quite the project! 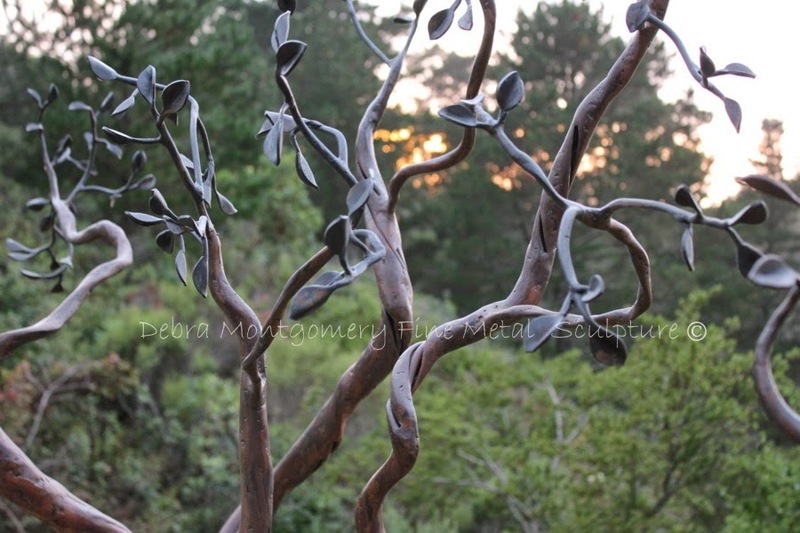 Have fun with your metal work!